Monsignor Mullins’ account of his twin careers as a De La Salle Brother and diocesan priest for over 70 years provides a fascinating in-person snapshot of Australian Church history from the 1940s to the present. His memoirs trace his life and career through his earlier years teaching in DLS schools and colleges, and following his ordination to the priesthood his work as a seminary professor. Between 1970 and 1990 during the papacies of Popes Paul VI and John Paul II he served as an official of the Vatican’s Education Congregation. Despite his advancing years Monsignor Mullins remains active in Sydney celebrating Masses, hearing confessions and engaged in administrative roles at the Chancery. As a former Brother, Monsignor Mullins taught at all levels from primary to tertiary before his ordination as a priest in 1975. He has a BA from the University of Melbourne, MEd from the University of Sydney, and MA and PhD from the Catholic University of America (Washington DC). 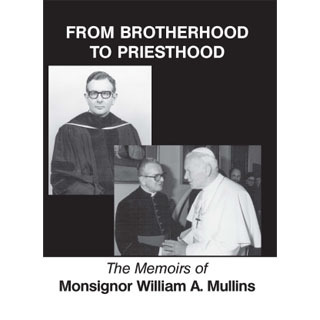 He worked for many years in the Roman Curia and those interested in the Church before and after Vatican II should find this work a must read, along with the many people who have been fortunate enough to associate with Monsignor Mullins.